This section explains basic methods for taking photos. Position the camera as upright as possible. The still image that is captured is saved in the internal memory of the camera. When shooting just with the camera, the image size is 5376 x 2688. Still images saved in the internal memory of the camera can be viewed on a smartphone or computer. Still images saved in the internal memory of the camera can be deleted using a smartphone. An accurate date and time are not recorded if images/videos are taken when the camera has never been connected to a smartphone. 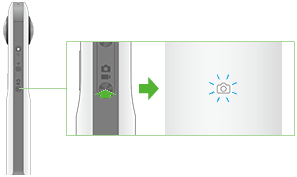 Some lighting statuses of the camera status lamp show that it is not possible to shoot photos. Refer to the following and check the status of the camera. The camera automatically enters the sleep mode if no operations are performed for a set period of time (default setting 5 minutes). Shooting is not possible in the sleep mode. Press the shutter button to enable shooting and then press the shutter button again to shoot a video. 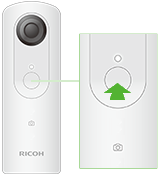 During sleep mode, the wireless function is turned off and cannot be turned on by pressing the wireless button. If no more images can be shot, delete images from the camera.